You can launch your very own Ning Network in three simple steps. Head over to Ning.com to get started. 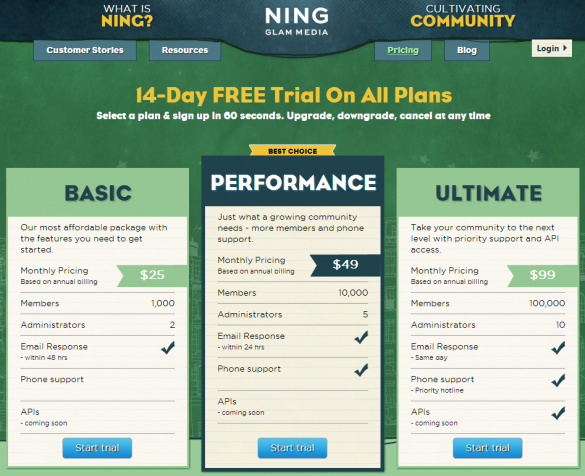 Click the “Try Ning for Free” button to begin your free 14 day trial of Ning. Then select the subscription you’d like to start with on the subsequent page. If you aren’t sure, select the Basic plan to try out. All plans include all features, so any will be a great way to determine if Ning is right for you. Please note that pricing on the page shows what the monthly fee amounts to if you have selected an annual plan. Monthly plan subscriptions are slightly higher, with $30 a month for the Basic plan, $59 for the Performance plan and $119 for the Ultimate plan. Plans differ in the number of members and moderators you can have on your network, API integration and support resources (for example, the Basic plan includes email support but not phone support). During your 14-day free trial, you can cancel your network plan if you decide this isn’t right for you. If you want to upgrade, downgrade or cancel, head over to https://www.ning.com and click on the My Networks tab to make these changes.